The Gallia Academy High School Symphonic Band, under the director of John Barrett, performed at the Ohio Music Education Association District 17 Adjudicated Event held at Shawnee State University, earlier this month, receiving a Superior (I) rating. CENTENARY — Young musicians at Gallia Academy High School are hitting all the right notes. The GAHS Symphonic Band performed at the Ohio Music Education Association District 17 Adjudicated Event held at Shawnee State University, earlier this month. The band competed and achieved a Superior (I) rating, qualifying the group to perform at the state level of competition in late April at Lakota East High School near Cincinnati. Around 54 students comprise the symphonic band, under the direction of John Barrett. Barrett explained the symphonic band program is comprised of students who sign up for the course at the beginning of the school year, where auditions for seating placement take place, along with being in a learning atmosphere meant to facilitate a love of music and a drive to be the best. Part of that drive is developing work to perform at competitions. At the competition held at Shawnee State, the band performed the classical pieces, “Peace Jubilee March” by Karl L. King with James Swearingen; “With Every Winter’s Breath” by Randall Standridge; and “Chimney Rock Celebration” by Robert Sheldon. 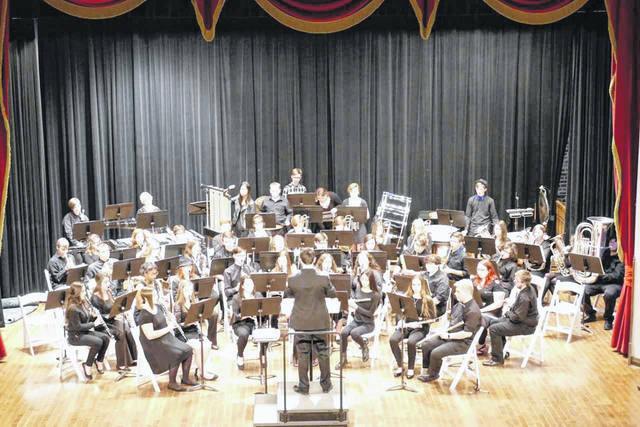 Though symphonic and concerts bands at GAHS have often competed at district competitions, Barrett estimated it had been since 2014 since the band qualified for state competition. Since taking the director’s chair about three years ago, Barrett said he has attempted to find music that meets the needs of students in grades 9-12; music that challenges both the beginner and more advanced musician. Over time, this sets “an expectation for the music we should be playing on a yearly basis,” Barrett explained. Over time, these expectations have turned into goals concerning what the program should and can be, motivating students to that “superior” performing level, he added. The band members have been preparing for the state competition by reviewing their district feedback from judges and while they can perform two of the three pieces that won them Superior ratings, they must incorporate a new piece – “Canto” by Francis McBeth. “We are taking those judges’ comments and trying to work on some weaknesses and make them strong points and refine strengths…we’re also bringing in guest clinicians to work with the students as well,” Barrett said. Arriving today to work with band members, and members of the Madrigals Choir, is Maestro Miriam Burns, who will be conducting the Ohio Valley Symphony this Saturday, when well-known Elizabeth Pitcairn and her legendary 1720 Stradivarius Red Violin perform in the historic Ariel Opera House in Gallipolis. According to the Ariel, Burns was on staff with the New York Philharmonic as one of their cover conductors for eight years. Now in her sixth season as music director of the Tysons McLean Orchestra in Virginia, Burns has also conducted the Tallahassee Symphony, the Kenosha Symphony and the Lawton Philharmonic as well as being principal conductor and music advisor for the popular multimedia orchestral show “RePlay: Symphony of Heroes” based on the symphonic music of video games. Burns will be leading The Ohio Valley Symphony in Stravinsky’s “Firebird Suite” which tells the story of Prince Ivan and his battles with the evil Koschei the Immortal with the help of the magical Firebird. Barrett said Burns’ visit is part of community outreach efforts by the Ariel with area schools, and called this exposure of the arts to students so close to home “a blessing” when it comes to utilizing these resources. He referred to it is as not only a musical skill, but a life skill. In addition, the Madrigals Choir also competed at the district event held at Shawnee State, earning a Superior (I) rating and will also be traveling to the state competition next month. As previously reported, the Madrigals performed at Carnegie Hall last weekend in New York City.